With the release of Octopus 3.5 you can now utilise Azure AD authentication. This document is an overview of how I have implemented this. In order for AAD SSO to work, I need an Azure Application created to set up the trust to Octopus. 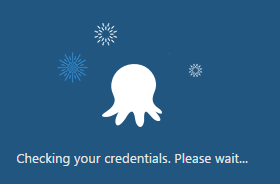 I already have an Azure Application for Octopus Deploy Service Principal. This is currently used as the Service Principal to allow Octopus to perform operations on our Azure subscription. In order to manage user/team membership via AAD, I have had to configure some Roles for the App. To add the Roles I have had to edit the App’s manifest. In the New Azure Portal, go to Active Directory, App Registrations, find the App you want and select it, click the Manifest button at the top. This is what I have added into the Application Manifest for the Octopus App. I have defined 3 x AppRoles in the Azure App. The ID value is just a random GUID that i generated with Powershell New-Guid command. The property Value is what will be used to add to Octopus Teams in order to manage access via AAD Roles and AAD Security Groups. The AppRoles we have just defined do nothing currently and should be assigned to Azure AD Security Groups to give us a central place to administer access into the App. All of the Team members should be placed in the relevant Security Groups when access is needed and removed from the group when no longer required. Creating the groups is done in Active Directory in the New Azure Portal. In New Azure Portal, Active Directory, Users and Groups, All Groups, Add. Create the required groups, following the naming convention of existing groups and ensuring there is a meaningful description used also. I have created 3 x AAD Security Groups, each one will be associated with the AppRoles and Octopus Teams. Now that we have defined the AppRoles and created the Security Groups. We can now start assigning Azure AD Security Groups to these Roles. 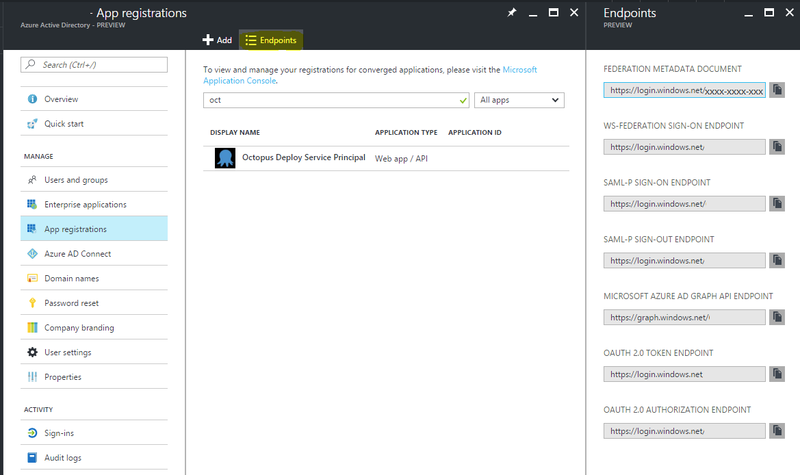 In New Azure Portal, Active Directory, Enterprise Applications, select the App “Octopus Deploy Service Principal”, select Properties. Turn on “User Assignment Required”. This option being set to Yes ensure’s that NO Users can access the App unless the Users are Assigned to the App or a member of a Group which has been Assigned to the App. Now to assign those Security Groups we created to the App. Go to the User and Groups setting of the App, click Add. Browse to the Group you just created and Select it. Browse to the AppRole you want to associate with the Group and Select it. Do this for all the AppRoles and Groups* you have created. These can be changed at the CMD Line on the Octopus Server In order to set AAD as the Auth Provider there are two values we need from the Azure Portal. The Client ID and Issuer. Once you have those values, run the following from a command prompt in the folder where we have installed Octopus Server “C:\Program Files\Octopus Deploy\Octopus” This will enable Azure AD as an Auth Provider and configure the required parameters. I have also disabled the internal user database of Octopus using the following command. To ensure all the users reside in AAD only. Then to configure SSO, I have ran the following command, which disables the login prompt.